These bulbs are very similar to Galanthus (snowdrops), their common names are snowflakes, though they tend to be much larger & more robust in growth and should be grown in the same garden situations as Galanthus. Miniature white flowers on short stems to 10cm in May, cold frame, alpine house or a warm garden situ with well drained soil. Milky white flowers, two to three on a stem, 15-20cm tall in September. 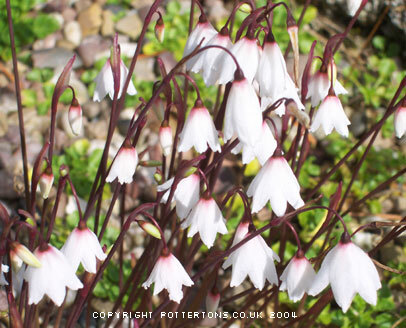 We find that this species does best in Alpine house, needs a dry summer period to flower well. The spring flowering snowflake - full of character. 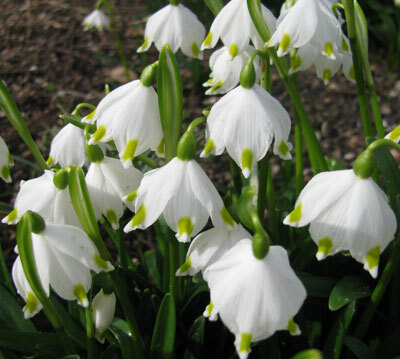 Short stems of beautiful white flowers tipped green from early February to late March. Bulbs are naturally a little soft and should be planted promptly upon arrival.